Here is a photo of my Barred Owl, adopted through the Adopt a Wildlife Ambassador Program offered by the Center for Wildlife in Cape Neddick, Maine. I chose this one because it reminds me of my owl in “The Owl Keeper” (except this owl is much bigger)! The center is dedicated to rehabilitating sick, injured and orphaned wild animals. The goal in treating these animals – owls, falcons, hawks, kestrels, turtles, opossums, bats – is to return them to their natural habitats. Unfortunately, sometimes the injury is too severe and the animal would simply not survive in the wild. Some of these animals remain at the Center to become an “ambassador” of its species in the education and outreach programs, where they are brought into classrooms, civic organizations, youth group meetings, and wherever else they’re needed. By adopting one of these animals, the sponsor helps cover costs of food, medical treatment and daily care for one year. Grace Lin wins Newbery Honor! 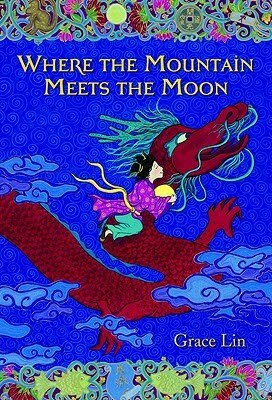 What thrilling news to hear that Grace Lin has won the Newbery Honor Medal for her book WHERE THE MOUNTAIN MEETS THE MOON! A well-deserved award for a beautiful book.